These photos were taken by Bernina at the Fashion shoot. "The Epic Quest of the Last Dragoness"
The Epic Adventure of the Last Dragoness! The outer layer consists of a long coat in juniper suede-look cotton with the patina of old books. One sleeve resembles pages with gold edge pleats and the other a teal leather spine which reads Dragon. 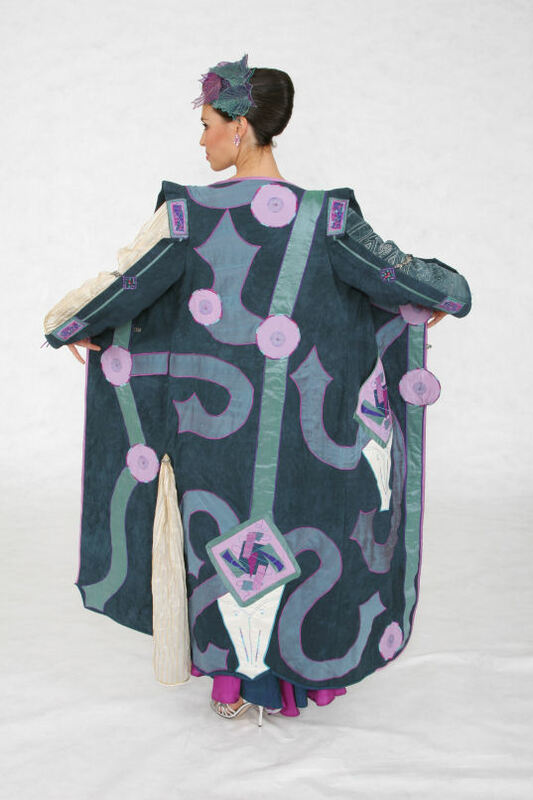 Dupion silk designs, based on Initials from the book of Kells swirl across the front and back with hints of what might lie within. Opening the coat, the book theme continues with Palazzo teal fountain-marbled fabric lining suggesting the marbled end papers of antique books. 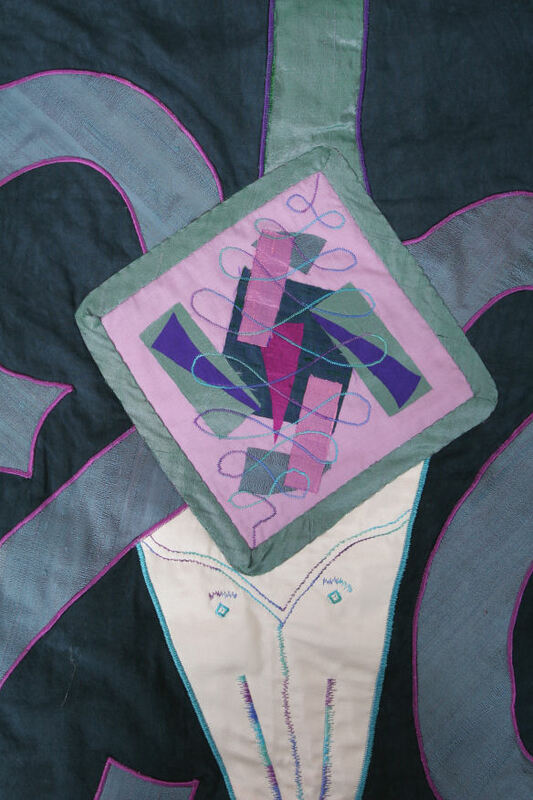 A scene of the Last Dragoness on her Endless Quest can be discovered on the centre back panel of the lining. 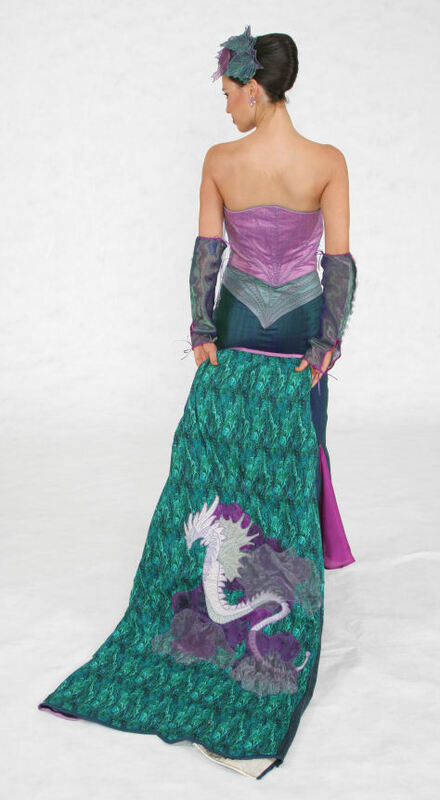 And, Lo, the lovely dragoness stands before us in her human form, her garment symbolising dragon shapes and textures: bright fuchsia godets of habotai in the royal/evergreen skirt of dupion evoke thoughts of dragons in flight, a gem-encrusted strapless bodice of wisteria dupion and beaded eucalyptus and cerulean dupion skirt yokes with corded ribs and wisteria flat piping remind us of wing struts. 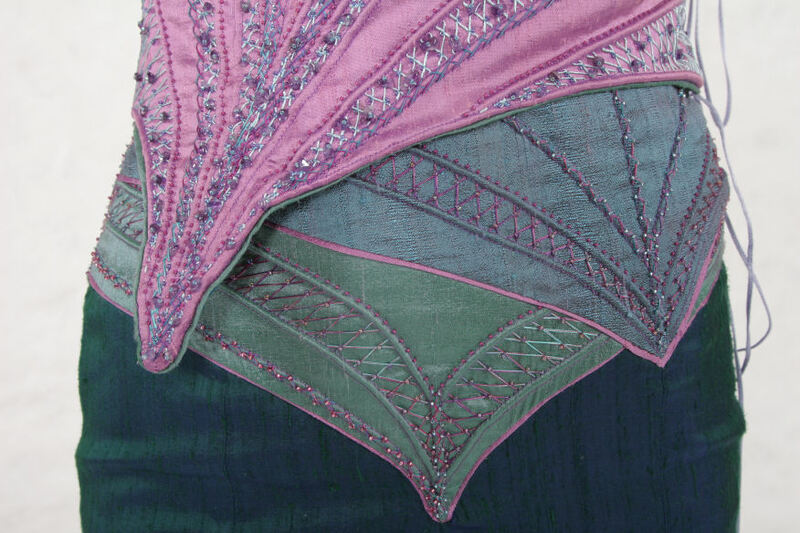 The lavender lacing and herringbone embroidery represent dragon scales, while the faux sleeves of metallic organza pictures beautifully the iridescence of dragon skin. 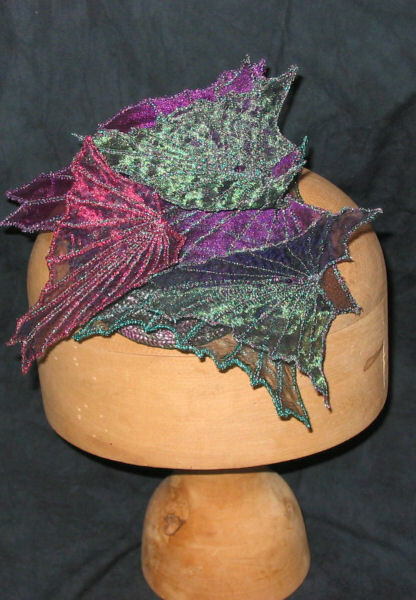 Finally, the small cocktail hat shimmers with glittering dragon wings.